Her comment also further endorsed the extent to which the United Nations had soiled its own founding affirmation to: “Save succeeding generations from the scourge of war ..” by declaring a new method of warfare, the withdrawal and denial of all life-sustaining necessities. 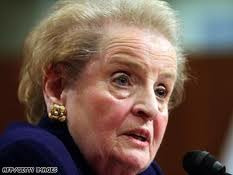 Albright, at the time of her astonishing statement was US Ambassador the UN (1993-1997.). Ironically, as a child she and her Czech family, her father a diplomat, lived in London during the 1939-’45 war, and whilst there she appeared in a film on the plight of children in war. In her autobiography, she describes how her experience and knowledge of the horrors and repercussions of war were also shaped by the terrible consequences for a small state when it collides with the ambitions of interests of a big one. Iraq’s twenty five million population and America’s three hundred and fifty million again come to mind. She enjoined in further heaping misery on Iraq’s most vulnerable as US Secretary of State (1997-2001.) Perhaps, as many, for good or ill, she was shaped by here childhood. When her family returned to Prague after the war, controversy was caused by their being given a home owned by a wealthy German family. Germans were expelled from the country, by Prime Ministerial decree after the war. At least it was only a house. The government she had served went on to take over – and comprehensively ruin plunder and further impoverish – two countries and their peoples. In Sept 2006 she received Menschen in Europe Award for furthering the cause of international understanding. Orwell strikes again. “These extraordinary honorees (have) challenged us … inspired us, and they’ve made the world a better place”, said the President. Reading this “Adventures of a Heroine” fantasy story, the memories of the Iraqi mothers I have held, their tears mingling with mine, or dampening my shoulder, as they watched helplessly as their children faded away in front of us, for want of medications, denied by Albright’s country and the UN she served, flooded back. The funerals, with the litany of coffins, so small, the impossibly little grave sites beyond counting, throughout Iraq, witness to unique wickedness. Her Award may yet haunt her to become the ultimate poisoned chalice.